The battle for innovation has begun. 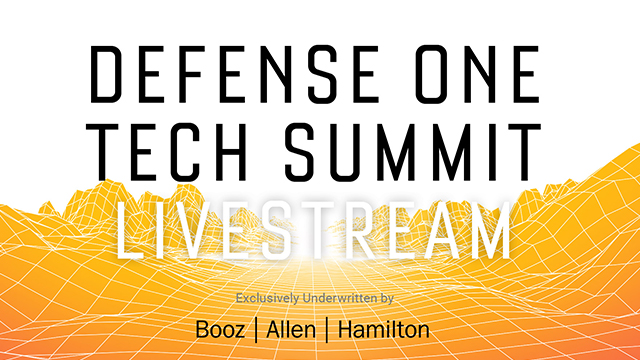 Join Defense Secretary Ash Carter and some of the brightest minds in military and consumer technology to discuss the future of innovation and national security at the first-ever Defense One Tech Summit. Something new is in the air. A mix of excitement and apprehension has emerged from the Defense Department’s deliberate outreach to Silicon Valley and the tech world. Stakeholders from Washington to Palo Alto are abuzz about a new era in public-private partnership. It all comes as global terrorism reaches European cities and American shores, and as Western governments navigate a re-emergence of superpower geopolitics. Carter has put the call out — for patriotism, good governance, and national security: the Pentagon wants you. But the conversation is far deeper than hoodied hackers and high-and-tight commanders exchanging wary glances. The longtime partnership between defense and tech is entering a new era. After World War II, the U.S. government, led by the military, contributed two-thirds of every dollar that went to science and technology research, the private sector just one-third. Those numbers have flipped. Every day, tech industry giants and charismatic entrepreneurs seize territory that used to be the sole domain of the government, from robotics and autonomy to cloud computing and space conquest. The military has taken notice, outsourcing more and more innovation to private-sector players. Now is the time to take stock, exchange ideas, and see what comes next. Now is the time for the Defense One Tech Summit. Tune in to view our afternoon sessions. Click "Attend" to confirm your registration. The 2nd Annual Defense One Tech Summit featured top technical thinkers in government, academia, Silicon Valley and beyond. We discussed how the game-changing tech of today will become the game-winning resources of tomorrow and paint a picture where commanders have more resources and capabilities to effect positive change and innovate for the future. The stakes could not be higher. The 2nd Annual Defense One Tech Summit will feature top technical thinkers in government, academia, Silicon Valley and beyond. We'll discuss how the game-changing tech of today will become the game-winning resources of tomorrow and paint a picture where commanders have more resources and capabilities to effect positive change and innovate for the future. The stakes could not be higher. While Secretary Ash Carter's controversial push to link the Department of Defense with the tech sector has forged the path of recreating defense information technology, a pivotal step in this IT transformation has been the push for digital - a prime example being the creation of the Defense Digital Service, led by some of the country's top tech talent. During this event, we'll talk with tech leaders across the defense space to explore the work being done within the Defense Department and Intelligence Community to bring effective change through modernization efforts and harness promising technologies to tackle national security challenges. The U.S. Army's rotorcraft fleet of Black Hawks is wearing out much faster than predicted due to a decade of high-intensity operations in Afghanistan and Iraq. In 2013 as part of the Future Vertical Lift program, the Army commissioned the demonstrator aircraft to bring in new technologies, materials and designs that will ensure this new rotorcraft can fly higher, farther and faster while carrying more. Tomorrow's helicopters won't resemble those of today. On December 6, Defense One will sit down with scientists, engineers and even flying car makers who are building next-generation experimental aircraft that could propel us toward a new Jetsons reality. And we'll talk to the decision-makers behind the scenes to discuss how the next generation of helicopters will get into the air and what this means for the future of national security. At the 4th Annual Defense One Summit, global security leaders will gather to explore three themes — Crisis, Conflict, and Continuity — as the American presidency shifts to a new commander in chief. As the war on terrorism rages on, senior officials will sit with national security journalists to discuss their views, goals, and predictions about a range of issues, from daily combat in Iraq to the grand-strategy games of the great powers, and the challenges of managing budgets, equipment, and people as they shift to a new administration. Join Defense One on Nov. 15 for a special Leadership Briefing to kickoff this year’s Defense One Summit. Adm. Harry Harris, Commander of the U.S. Pacific Command is sitting down with Kevin Baron, Defense One Executive Editor, for a one-on-one conversation covering the challenges and future of the Pacific Command. Click here to learn more and register for this event.